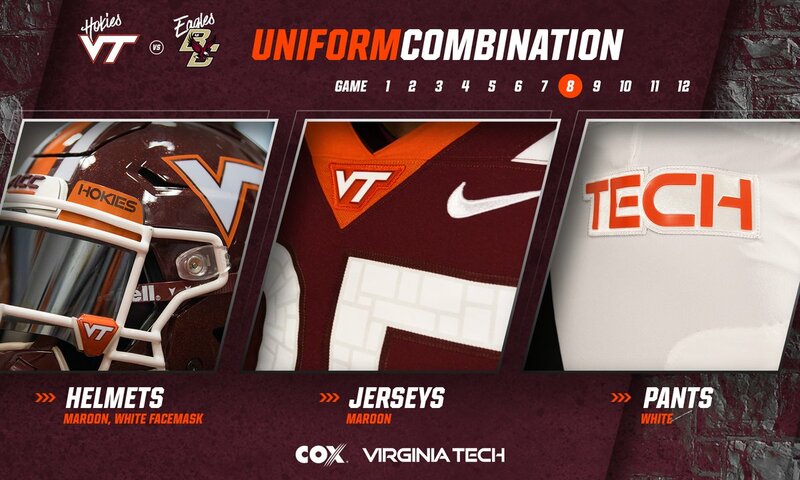 Virginia Tech Football’s uniform reveal for Boston College is the standard home uniform, with a twist: an old-school white facemask. The Hokies (4-3, 3-1 ACC) and the Eagles (6-2, 3-1 ACC) will kick off Saturday, November 3 at 3:45 PM. The game will be televised on Raycom. Click here for affiliate listings. zzzzzzzzzzz. Will this make them play better? Gosh. Does any football fan over 30 really care? Can’t wait to see the team reveal. Which team will show up?